Among the sculptors who worked on the Castel Nuovo arch (there were at least nine, each with his assistants) was Francesco Laurana. He is best known for a series of idealized busts of women, many made for the court in Naples. They are among the most arresting portraits of the Renaissance, and the most mysterious. Scholars disagree about how many and which ones were actually carved by Laurana. The identities of the sitters also provoke debate. 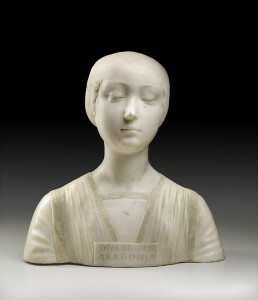 Only two are named by inscriptions, including this one of Beatrice of Aragon (the other is Battista Sforza). Beatrice was a daughter of Ferdinand (Ferrante), who succeeded Alfonso as the king of Naples. Her portrait is likely to have been made about the time of her marriage, in 1476, to Matthias Corvinus, the king of Hungary. Like all Laurana’s female portraits, Beatrice’s image is highly idealized, almost to the point of abstraction. Her cool remoteness is accentuated by lowered eyes, delicate, even attenuated, features, and the smoothness of the carved surfaces. This extreme refinement, which subsumes individuality into elegance, makes the identification of unnamed sitters very difficult. Laurana also created male portraits, though apparently far fewer. Interestingly, they are all highly individualized. The blemish-free perfection of the women reflects a Renaissance ideal that equated female beauty and virtue (see Picturing Family and Friends). Originally this bust would have included color on the hair and dress. Many Renaissance marble sculptures were painted, but few retain more than scant traces of pigment.